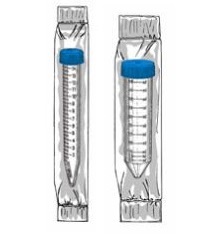 Rose high quality sterile, individually wrapped conical 15 mL and 50 mL conical centrifuge tubes feature printed graduation and are supplied with blue screw caps. Manufactured with medical grade plastic copolymers and polypropylene. The printed graduations are extremely clear and readable. A Certificate of Sterility is available upon request. Each sterile wrap is imprinted with its lot number, for maximum traceability. Inquire about a skirted type version of the 50 mL centrifuge tubes. Rose Scientific will provide Volume Pricing for case lots as well as Blanket Purchase Orders for scheduled time delivery.